The Walking Dead‘s Lennie James has revealed details about the major character deaths to come in the second half of season seven. Executive producer Gale Anne Hurd may have promised to tone down the violence in the next half of the season, but it looks as though fans should still expect a few major losses on the show this year. 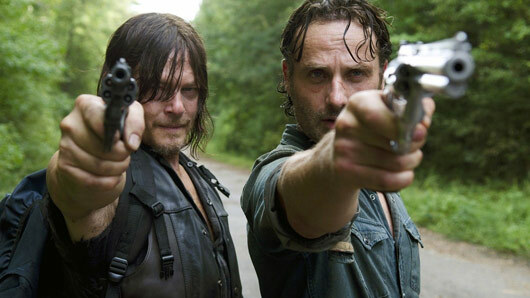 However, The Walking Dead fans should still prepare themselves to say goodbye to some big characters it seems. Lennie James, who plays Morgan, has revealed how many deaths are on the cards for the next eight episodes. Speaking to Metro newspaper, he explained: “I can say that the second date you’ll be introduced to one, maybe two, new worlds. There are a couple, two, three, major losses. And there is a push towards war. “There are lines being drawn, us in Rick’s group are learning about the breadth of Negan’s dominion – who that entails, how far it spreads and how long it’s been going on. “And some people in the lines being drawn, as we come towards battle, there’ll be some surprises as to which side of the battle certain people end up on. Lennie also spoke about his future on the show. He said: “I know the show well enough to know everybody dies. You don’t walk into The Walking Dead and go, “Oh I should buy a house on day one”. It’s an inevitable part of the process. “At the moment I’m having a good time so I’m hoping he hangs around for a bit. It is a bit like being a British football manager – you know at some point you’re going to get the sack.